This book really stuck with me after I finished it. I won an e-copy and print copy of this book from Ms. Olive, and read it through in one sitting. Ms. Olive floored me with her interesting and strange story of life and death. Who knew kissing a corpse would change everything? Death always hits Xylia Morana too close to home, but she likes it that way. She hangs out with the terminally ill, attends random funerals, and every so often, when the weather is right, she sleeps in open graves. But after Landon Phoenix, the high school hottie, dies in Xylia's hands, she sneaks into the morgue to say goodbye. 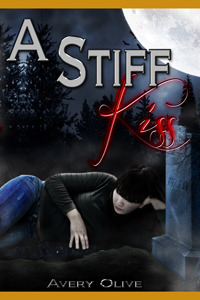 How could she know stealing a kiss from his corpse would wake him up? With Landon returned to the living and suddenly interested in Xylia, life has new meaning. But what Xylia doesn't realize is that by kissing Landon back to life, she's thrown Life and Death off balance. The underworld demands a body, and it might just have to be Xylia's this time. To me, this book was interesting, to say the least. I was first fascinated by the names of the characters. Xylia is a name I've heard of, in books or otherwise. I also really like the name Landon Phoenix. Phoenixes are one of my favorite mythical creatures. I liked the character building in this book. As readers, we really get to see the growth of character in both Xylia and Landon. From Xylia we see and understand her passion for death and funerals and graves. We see her gradual change in behavior towards her father. I love the ending, and how she fought for something (no spoilers!). Landon is an awesome guy! He doesn't strike me as the typical young adult hot boy that every young adult book girl wants. I loved his reactions to Xylia's strange habits. I felt what he felt, especially when it came to the open grave! I like him, because despite his confusion about death and Xylia's oddities, he stuck with her up until the end. Oh, the end. I like how everything came full circle. It was a fitting end. I like this book as a standalone. A series wouldn't really fit, although, I never know what authors can come up with! Well, I like Xylia because she's not the cool, loved, popular girl in high school. I like Landon for sticking with her despite her weirdness. But the weirdness, that was something I could not wrap my head around. Someone who likes to sleep in open graves?! Ms. Olive didn't expound upon it, but I'm pretty sure that's a psychological problem. That is so strange. Of course, people do crazier things. But that is really, really weird. I didn't like how Xylia left her father, and put him through what she did. That was teenage selfishness (which I can see, because I am a teenager), and that makes it understandable. There wasn't much else that I didn't like. Get passed the weirdness of Xylia's habits, and it's an awesome read! Yes! It's a great standalone. I think Ms. Olive has a great feel for writing and knows how to create a genuinely interesting story. Since it is set around high school students, I would recommend this book to any teenager and up. 4 stars. Great job, Ms. Olive! I can't wait to see what else you've got! Ooh! This sounds great! I love books that have the guy's POV, too, and I just love that name...London. Sigh. Nice! Awesome review Alyssa! It is really weird for a teenage to sleep in open graves whooo I never read anything like that before I have heard about this book and it sounds and looks very interesting I have too most definitely have to check it out! thanks for sharing Alyssa! LOL it is! But the uniqueness is what drew me in. You're very welcome! Introducing Kate Evangelista's THE LIST! Cover Reveal: Facade by Nyrae Dawn! Miriam Forster Presents: 30 Days of Bookery! YA2U - Bringing YA to You!